I went looking for a new photo spot today and this is what I found nestled behind a toddler's playground. And I wanted to chuck the photoshoot and set off and see where the paths might take me. 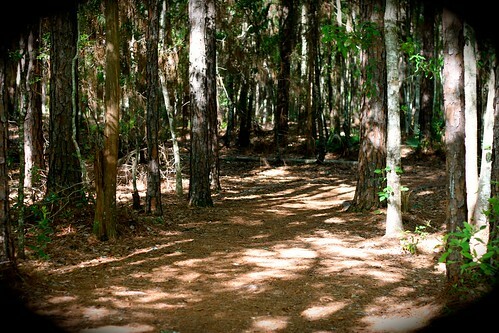 When I was a kid I didn't play on playgrounds - I played in the woods. We built clubhouses out of people's cast offs and branches and sheets. There was always somewhere to explore. This place needs exploring and I plan on taking the boys as soon as we can! But the reason I was out "in the woods" today was to photograph this beauty. Lawsonia. It's a crescent shaped shawlette (why yes I am addicted to these) cast-on and worked in my favorite method with a gorgeous leafy edging and finished off with crochet loops. The yarn is not quite semi-solid and not quite variegated. I guess you would call it a tonal. But the large areas of stockinette and the strong lace motifs stand up nicely to the blues and greens with hints of purple. Lawsonia is on sale for the rest of this week for 25% off to celebrate it's unveiling. This baby has been a long time in the works. Circumstances conspired to make it's original debut untenable but now finally you get to see her. 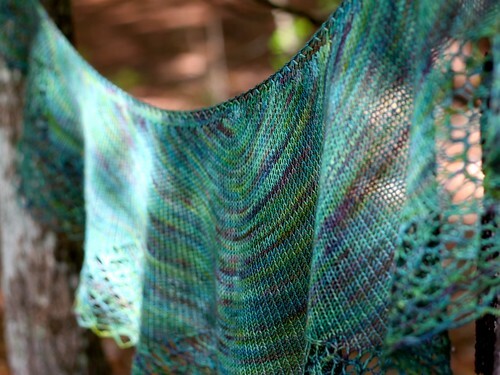 And in a lucky coincidence a good friend of mine has a new shawl debuting today as well. 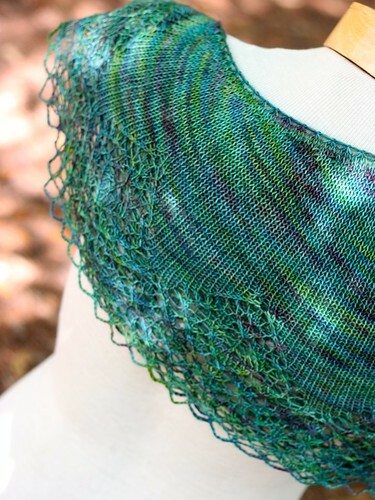 The Ceili Shawl was supposed to come out with Lawsonia, so we thought it was only fitting that they come out together. They actually use a part of the same lace motif - totally a surprise as they were supposed to be in the same publication - so we're calling them sisters! 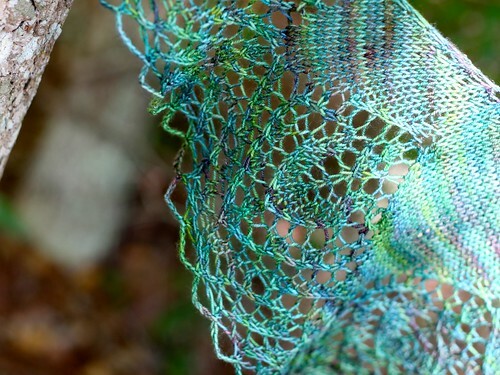 If you comment here on this entry you can win a copy of both Lawsonia and the Ceili Shawl for your very own and you can knit up these lovely sister shawlettes. The winner will be drawn next Tuesday, April 16th. Head on over to Tabetha’s blog and leave a comment there for another chance to win both patterns!